As a child, JC Smith never dreamed of becoming a playwright or serving as creative director of his own theatrical troupe. "I was in my high school choir and shifted into musical theater," the 25-year-old recalls. "Lighting design was my passion." Closed Door Entertainment writer, director, actor and producer JC Smith visits fellow actors in the dressing room. Today, Smith is, by day, a legal assistant with the firm Patrick, Beard, Schulman & Jacoway; by night he is writer, director, actor and producer for his own Closed Door Entertainment company. And now, this young turk who was nominated for a 2008 Pulitzer Prize is preparing the launch of his theatrical group as a regional and touring company. A graduate of Chattanooga School for the Arts and Sciences, Smith attended the University of Tennessee at Chattanooga for a semester before moving to Nashville "where I started running hotels." But just as an interest in singing led to musical theater, an interest in writing brought him into the limelight. "I wrote a two-act play and wanted to see it on stage," he said. "I had no visions of grandeur, I just wanted to see the script come to life." When none were willing to stage his play, Smith took it upon himself to produce, direct and perform the piece at Barking Legs Theater in 2006. That first success was followed by his producing another original play at the Chattanooga Theatre Centre. Over the course of five years, Smith and his ever- growing troupe of actors have performed more than 40 plays. It was the desire to produce his musical, "Brothers of St. Benedict," that brought Smith to The Colonnade, where for nearly three and one-half years his Closed Door Entertainment company has been delighting audiences. "We've grown," he said. "Now we have a 20-person crew with professional painters and a set master who builds million-dollar homes. Our choreographer comes from Atlanta, and between 40 and 70 actors have been in our plays. "We started with a three-piece pit band and today have about 40 musicians in our orchestra." Closed Door Entertainment has been both victimized and lionized by its success. "We've outgrown The Colonnade," Smith said. "This is a beautiful venue, but it is very difficult to operate there." While the theater has state-of-the art equipment, there is just not enough of it: the stage is small, the loading dock was installed as an afterthought, dressing and prop rooms are inadequate and the orchestra pit can barely accommodate half of Closed Door's musicians. Still, it has been a good home for nurturing a company. "I think there is a hunger and thirst for live theater in this area," Smith said. "If you build it they will come; really, they will come." In addition to audiences thirsting for theater, the area has a wealth of talent willing and able to dedicate themselves to bringing the "live" to live theater. "One thing I've always tried to do is to 'do the best' and that has attracted people with a similar view," Smith said. "With a lot of companies, it feels like actors treat their work as an unpaid job, not a labor of love. Here it is like a family." The family that is Closed Door Entertainment will call Chattanooga's Tivoli Theater home in the coming year, but the company will also perform throughout the tri-state region, with dates in Atlanta, Huntsville, Nashville and Knoxville. Closed Door has gained nonprofit 501(c)3 status, which should help in soliciting sponsorships and underwriting. But Smith says eventually he would like to operate as a for-profit business, one where actors and staff are paid and the company is self-supporting. "I would love to work full-time in the theater, but until I can compensate my lieutenants I don't see that happening," he said. 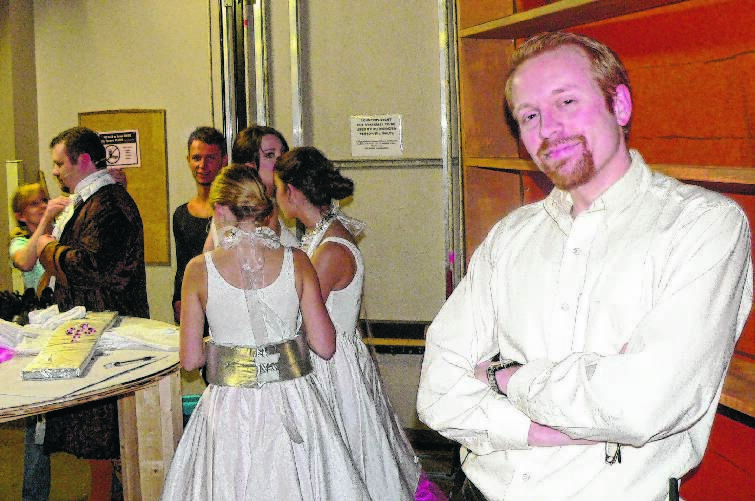 In the meantime, the curtain has come down on Closed Door Entertainment's final production at The Colonnade. "My main goal is for Closed Door to become a household name for theater lovers," Smith said. "We can't touch Cumberland County Playhouse, but are hot on their tails."